Walter Dean Myers died today. With this sudden loss, his much-read New York Times opinion piece from this past March takes on the character of a final charge to the kidlit community. One I hope we will fulfill. Here's a book from my shelves. If memory serves (it occasionally does) my brother bought it for the cover price of 1.50 at The Book Worm, a shop around 15 miles from our home. We bought books there sometimes, when we were in funds-- books by Walter Dean Myers, and S.E. Hinton, and John D. Fitzgerald, and Mildred Taylor. The books were all, like this one, modest in size and presentation. The Potterquake was still far in the future, and the children's book market wasn't anywhere near as competitive as it is now. Hold onto that last thought. It's important. In this long ago world, computers were vast objects that filled an entire room, and nothing went "beep" except automobile horns. Local volunteer firemen used to take all us village kids on long, long night rides atop the fire trucks and we were allowed to put out the streetlamps with the searchlights. Kids roamed freely in the fields and forests; no one expected anyone so patently annoying as us to be kidnapped. The kids in Walter Dean Myers's books explored just like us, only in Harlem. That interested us. We climbed about in barns; Myers's characters roamed abandoned buildings. We rode our bikes down the steepest hills we could find; Myers's characters did wheelies. Harlem was a different world-- but these characters were fully relatable. It had clearly never occurred to anybody at The Book Worm that the kids in a nearly all-white community wouldn't want to read books about kids in Harlem. As you can tell from the cover, it also hadn't occurred to anyone at Avon Books that since the majority of American children were white, black children ought to be kept off book covers. There can certainly have been no idea that the books were somehow Special Interest, rather than mainstream. The Book Worm was about the size of the average motel room, with no shelf space for Special Interest. "...This was exactly what I wanted to do when I wrote about poor inner-city children — to make them human in the eyes of readers and, especially, in their own eyes. I need to make them feel as if they are part of America’s dream, that all the rhetoric is meant for them, and that they are wanted in this country." I can only speak to the first part of Myers's wish. Mission accomplished. We ate these books with a spoon. Any suggestion that we shouldn't, or wouldn't, or couldn't have done so would have had to come to us from adults. No adults obliged. We grew up. The Myers books got tucked onto a shelf with many others. The Potterquake came along and shook the children's book world to its core. And the annual output of children's books tripled. The number of children, however, did not. Suddenly the children's book world got more competitive. It became necessary to find an edge wherever one could. Covers became a matter of intense study and scrutiny-- what would attract readers? What would repel them? 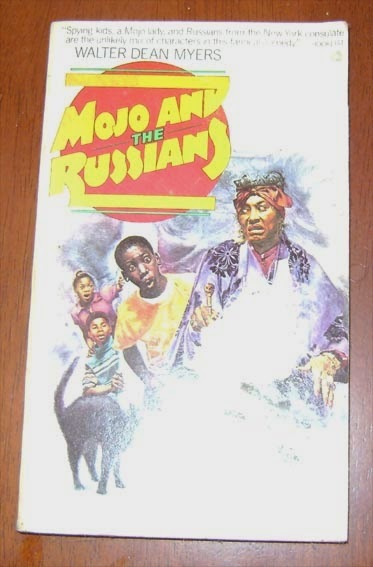 There followed a period of several years during which African-American characters-- and, to a lesser extent, other characters of color-- vanished from the covers of children's books. Books that had a protagonist of color would show something non-human on the cover-- a symbol, a building, a monster, anything! Or the protagonist would appear in silhouette. Or, in what quickly came to be known as whitewashing, the protagonist would be shown on the cover but would have mysteriously lost melanin. I see signs that this is dying out. I still think we have a long way to go before we progress to the point we were at in 1977. But I think that we've passed our nadir, and we're on an upward climb. Characters of color are reappearing on book covers, and some of them are even African-American. We can do better, though. We can do so much better. Let's do it for Walter Dean Myers.